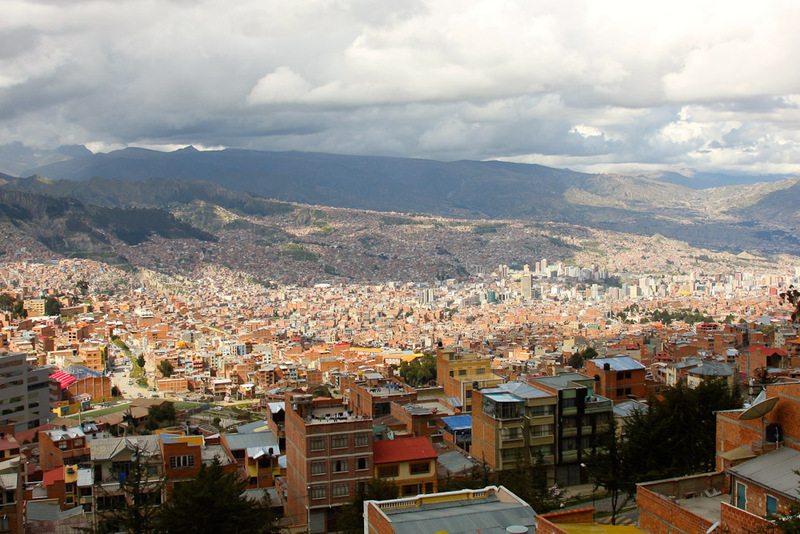 A breathtaking view of La Paz (photo: Tricia Welsh). Cordillera Real of the Andes provides an awesome backdrop for La Paz. 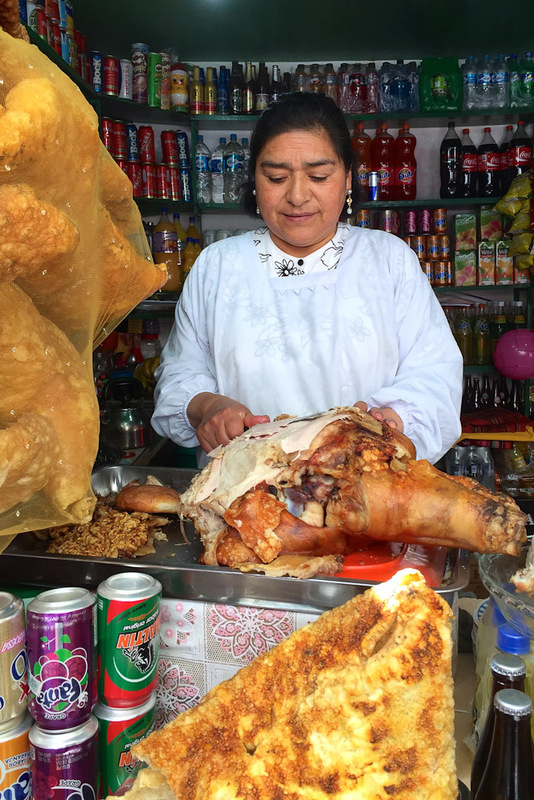 A woman preparing roast pork sandwich de Chola with pickled vegetables and crackling (photo: Tricia Welsh). 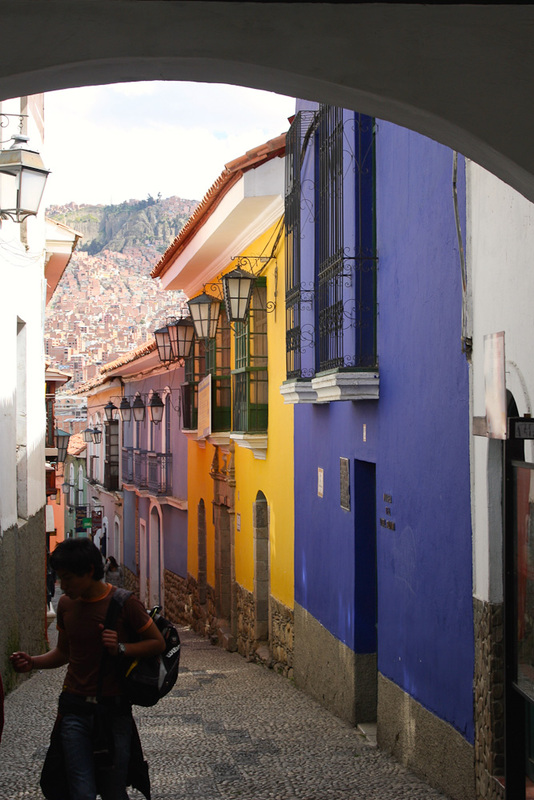 Colourful Calle Jaén is the best-preserved colonial street in La Paz (photo: Tricia Welsh). A traditionally dressed chola with a bowler hat in the India Market (photo: Tricia Welsh). 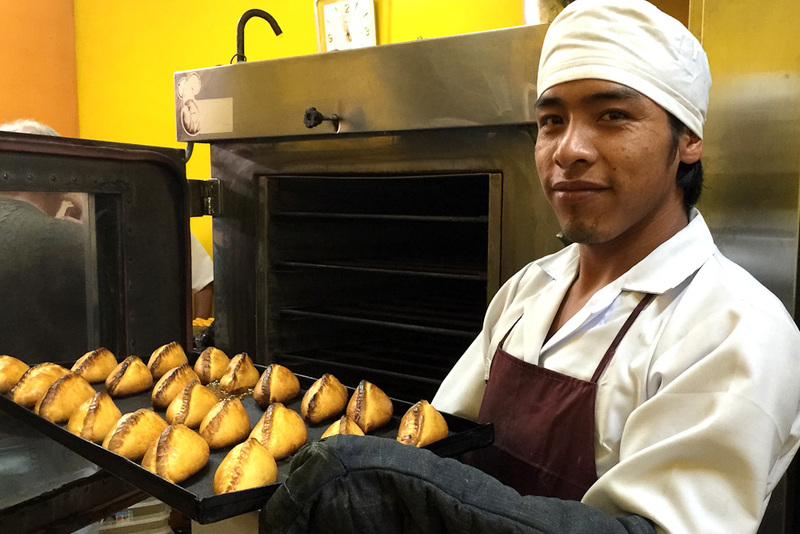 Try some Salteñas, they are baked savoury pastries filled with beef, pork, chicken or vegetables (photo: Tricia Welsh). 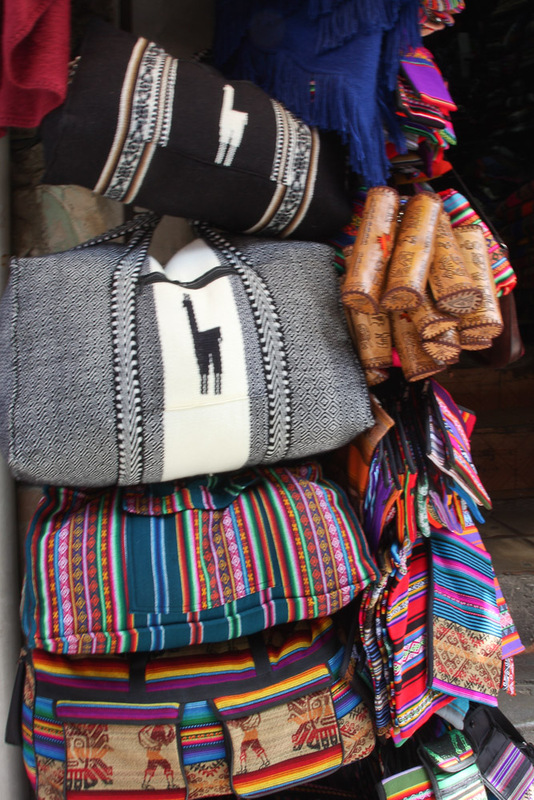 Don’t leave La Paz without some alpaca woollen goods (photo: Tricia Welsh). 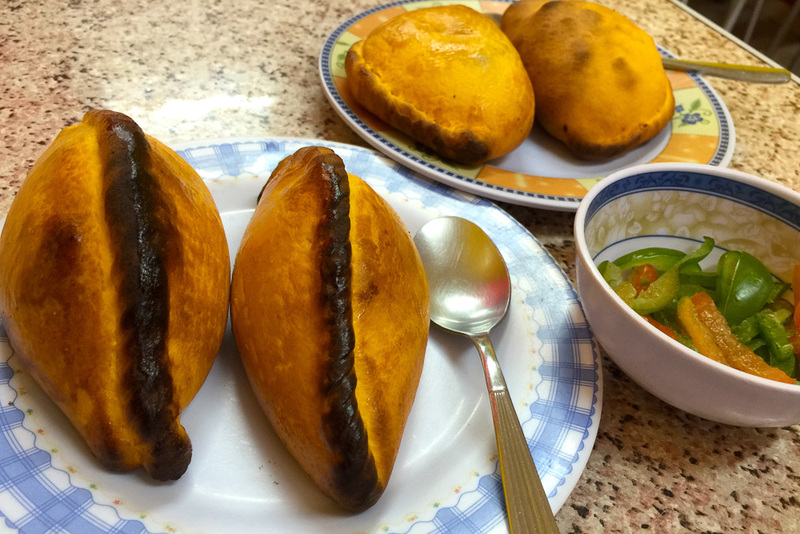 Saltenas: the must-try Bolivian street food. The bizarre clay formations of the La Valle de la Luna ( Valley of the Moon) said to resemble the face of the moon (photo: Tricia Welsh). Gutsu restaurant serves innovative dishes. 9AM Take a taxi to the main square, Plaza Murillo, in the city’s old colonial centre and join locals eating ice-cream and feeding the pigeons. While this square houses the Palacio Presidencial and the Palacio Legislativo, most visitors go to see the latter’s ‘backwards’ clock whose numbers are set anticlockwise and said to symbolise the political process of change in Bolivia. 9:30AM Continue to colourful Calle Jaén nearby. The best-preserved colonial street in La Paz, it is home to five municipal museums, all accessed on a single ticket and sold only at the Museo Costumbrista Juan de Vargas. Visit the Museo de Instrumentos Musicales de Bolivia to view pre-Colombian pipes, nose flutes, weird little leather trumpets and even toucan beaks; and the Museo de Metales Preciosos for its displays of Inca and Tiwanaku gold and silver. 11AM About a 15-minute walk away is the historic colonial Iglesia de San Francisco with its beautiful mix of mestizo-Baroque architecture. Built between 1750 and 1784, it was financed mostly by wealthy silver mine-owners. 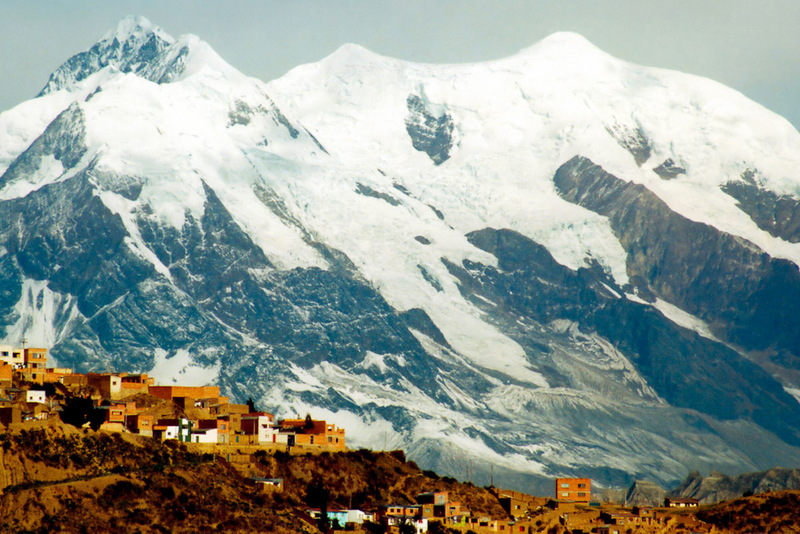 Buy a church museum ticket just to take in the lofty views over La Paz. NOON Lunch on street food along bustling Sagarnaga Street or in Mercado Lanza in central La Paz. 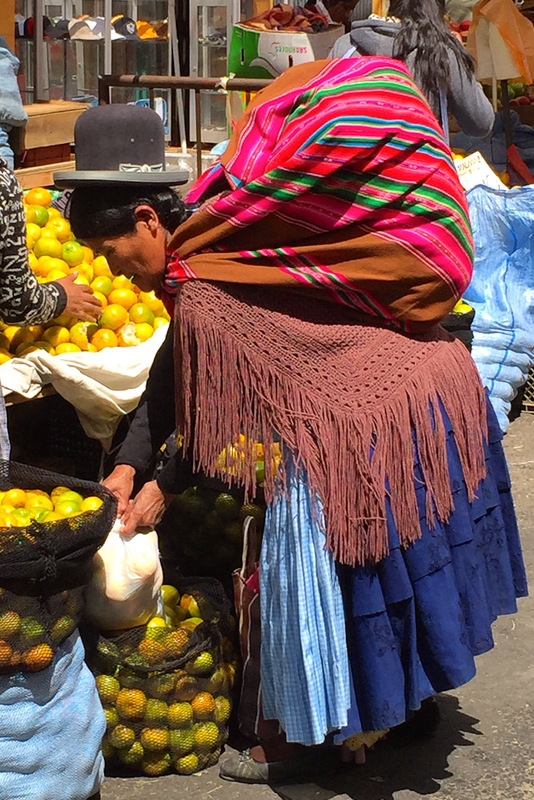 Take a DIY food tour with Suma Phayata meaning ‘well-cooked’ in Aymara. This handful of stalls serve authentic Bolivian dishes: beef chorizo choripan with mustard, fresh pickled vegetables and crusty bread; spicy beef tripe soup served with potatoes and salad; fried empanadas with different fillings including prawns and cheese; chargrilled beef hearts; and roast pork sandwich de Chola with pickled vegetables and crackling. And all for about $1 each. 1PM Be prepared for some weird sights in the Witches’ Market in Linares Street: dead newborn llamas, curious potions and concoctions, candles for the Day of the Dead, items for witchcraft, coca tea and coca lotions. Some of the vendors are yatiris – natural healers and sorcerers who can predict your future using coca leaves, the raw material for manufacturing cocaine. It’s been traditionally chewed and brewed by the indigenous people of the Andes for centuries. Wander the labyrinth of streets here for terrific leather handbags, alpaca woollen clothing and silverware. 5PM Take a taxi to the spectacularly sited Mirador Killi Killi, passing the Hernando Siles stadium, the largest sports complex in Bolivia. From up here, watch the sun set over this vertical city of cheek-by-jowl houses for nearly 800,000 inhabitants. 7PM Do as the locals do and head for El Prado in the city’s centre and Abaroa Square. Make a night of it and seek out one of the Peña Folklorica shows along Illampu Avenue or Sagarnaga Street, where you can enjoy an authentic Bolivian experience of singers, musicians and folk dancers while dining on traditional food and drinks. 9AM Breakfast on freshly squeezed natural fruit juices and just-made fruit salad at one of the stalls in Mercado Lanza. Try the sugar-sweet cotton-candy pacay or ice-cream bean, juicy guapurú whose purple orbs grow on its tree trunks, or the antioxidant-rich achachairú, a relative to the mangosteen. 10AM Grab a cab to the yellow station of the Mi Teleférico (My Cable Car) in Sopocachi and ride this new system of transport as it glides effortlessly up to the cliff-edge city of El Alto, which at 4150 metres is the highest major metropolis in the world. Views on the 500-metre-high journey are spectacular, overlooking typically red-brick houses below with the glacier-capped Cordillera Real of the Andes as a backdrop. Later, descend via the yellow line and change to the green line to Irpavi station on the south side of the city. 10:30AM Take a taxi to Calacoto and San Miguel. In this, the more modern part of the city, browse boutiques for local fashion designs, sip local Bolivian coffee and look for fine silverware, which the country is famous for. 1PM Choose from any number of local restaurants at San Miguel that serve national and international fare, or try some more street food such as salteñas (baked savoury pastries filled with beef, pork, chicken or vegetables) or deep-fried empanadas tucumanas. 2PM Cab it to La Valle de la Luna (Valley of the Moon), some 10 kilometres south-west, where the bizarre clay formations resemble the face of the moon. There is often a swish-skirted, bowler-hatted cholita who happily poses for photos. The nearby home workshop of leading contemporary ceramic artist Mario Sarabia behind high garden walls is a tranquil oasis: his pots are beautifully crafted and decorated and his studio doubles as a showroom for his jeweller daughter’s exquisite Churka Designs. Look for the local amethyst-type gemstone, bolivianita. 5PM Just a five-minute walk away, near the Oberland Hotel, the more adventurous can take a one-hour quad bike tour of these natural otherworldly formations for around $35 per person. 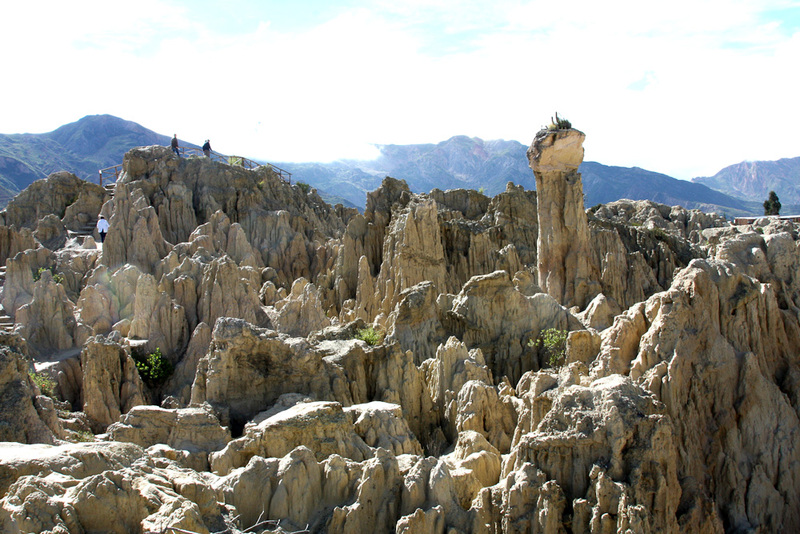 For the more serene at heart, take a taxi to Alkamari and watch the sun set over the even more surreal jagged form of Valle de las Animas. 7:30PM Back in the city, dine at Gustu (you’ll need to pre-book), a chic restaurant established in recent years by Danish-based Claus Meyer, co-founder of highly rated Noma in Copenhagen. 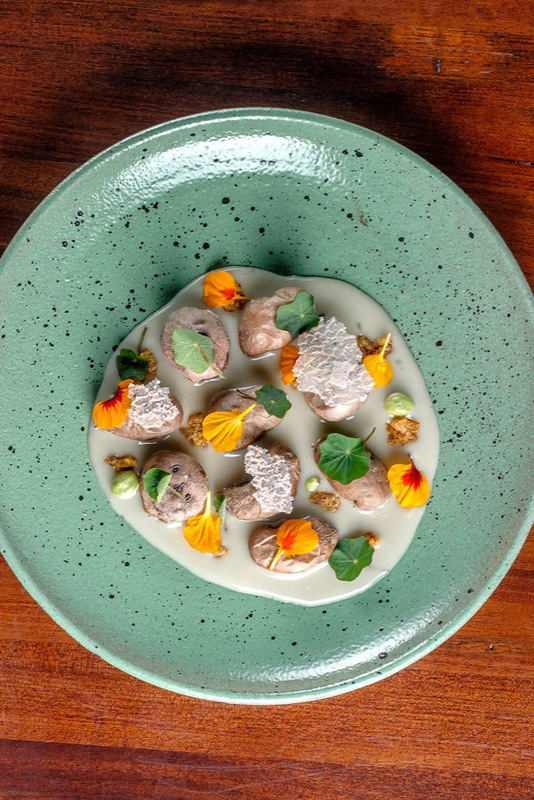 Already receiving accolades as one of the best restaurants in South America, it serves innovative dishes such as llama tartare with pickled egg yolk and nasturtium, smoked trout from Lake Titicaca with fermented kimchi-style vegetables and llullucha (an edible bacteria), and goat cheese ice-cream with Romaine lettuce and white chocolate. Try the tasting menu of five, seven or 15 courses paired with local beverages and wines.